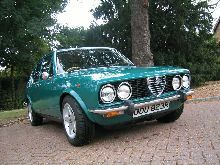 Alfa Romeo launched an all new saloon model in 1972, the Alfetta Saloon. 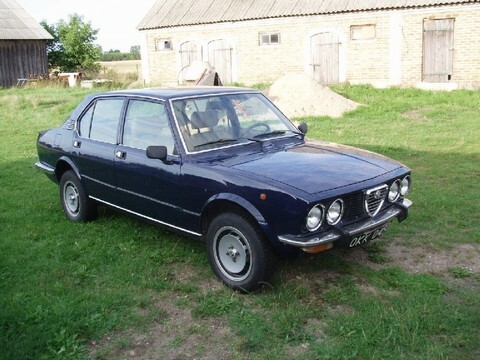 Although the Alfetta had a fairly conventional unitary construction, four door body it had an unusual gearbox layout (for a saloon). 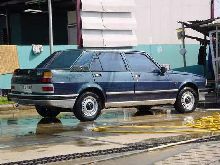 The Alfetta had a Ferrari style trans-axle. 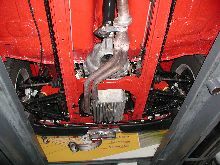 This meant that the gearbox was combined with the rear axle and so provided a better weight balance. 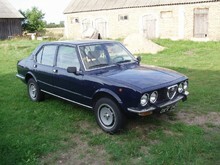 The Alfetta came with a 1.8 litre twin-cam engine to start with, however the engine was reduced in size to 1.6 litres in 1975. 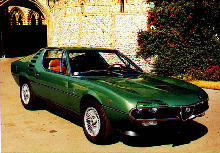 From 1977 a more powerful 2.0 litre engine was made available. Twin Weber 40 carburetors were also used for the 1.8 litre model. 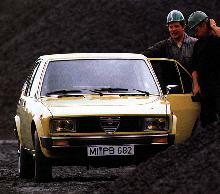 Production of the Alfetta saloon continued until 1984. 0' 98" 0' 53" 0' 53" 0' 172" 0' 64" 0 (22) 0' 0"